space 1 of the outer gear. As the gears continue to rotate in clockwise direction and the teeth approach point (X), tooth 6 of the inner gear will mesh with space 7 of the outer gear, tooth 5 with space 6, and so forth. During this revolution, tooth I will mesh with space 3. As a result, the outer gear rotates at 1,400 rpm, and the outer gear will rotate at 1,200 rpm. At one side of the point of mesh, pockets of increasing size are formed as the gears rotate, while on the other side the pockets decrease in size. The pockets on the right-hand side of the drawings are increasing in size as one moves down the illustration, while those on the left-hand side are decreasing in size. The intake side of the pump would therefore be to the right and the discharge to the left. Since the right-hand side of the drawing in figure 10-5 was turned over to show the ports, the intake and discharge appear reversed. Actually, A in one drawing covers A in the other. 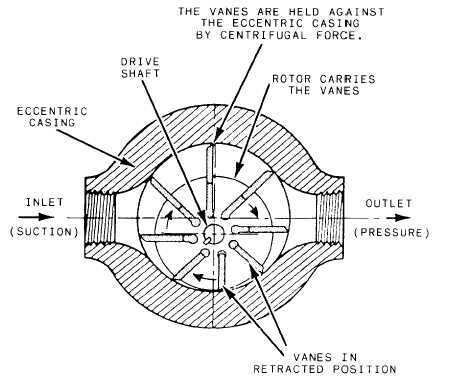 VANE PUMP. - Figure 10-7 illustrates a vane pump of the unbalanced design. The rotor is attached to the drive shaft and is rotated by an outside power source, such as an electric motor or gasoline engine. The rotor is slotted, and each slot is fitted with a rectangular vane. These vanes, to some extent, are free to move outward in their respective slots. The rotor and vanes are enclosed in a housing, the inner surface of which is offset with the drive axis. As the rotor turns, centrifugal force keeps the vanes snug against the wall of the housing. The vanes divide the area between the rotor and housing into a series of chambers. The chambers vary in size according to their respective positions around the shaft. The inlet port is located in that part of the pump where the chambers are expanding in size so that the partial vacuum (low-pressure area) formed by this expansion allows liquid to flow into the pump. The liquid is trapped between the vanes and carried to the outlet side of the pump. The chambers contract in size on the outlet side, and this action forces the liquid through the outlet port and into the system. The pump is referred to as unbalanced because all of the pumping action takes place on one side of the shaft and rotor. This causes a side load on the shaft and rotor. Some vane pumps are constructed with an elliptical-shaped housing that forms two separate pumping areas on opposite sides of the rotor. This cancels out the side loads; therefore, such pumps are used quite extensively in power steering units in CESE to provide the flow. Figure 10-7.-Typical vane type of hydraulic pump.